This 2-in-1 ticket and tour experience combines one of our most popular Vatican tours, which includes St. Peter's Basilica, with a skip-the-line ticket to the Colosseum. This ticket also grants access to the Roman Forum and Palatine Hill. Skip the long line at the Vatican with priority access and see all the major artistic and architectural highlights inside Vatican City. Our entire Vatican tour covers the Vatican Museums, the Sistine Chapel, the Vatacombs, where you'll see the underground tombs of former Popes, and St. Peter's Basilica, all in about three hours. You can read more about the tour itinerary for your Vatican tour here: Vatican Museums, Vatacombs, and St. Peter's. 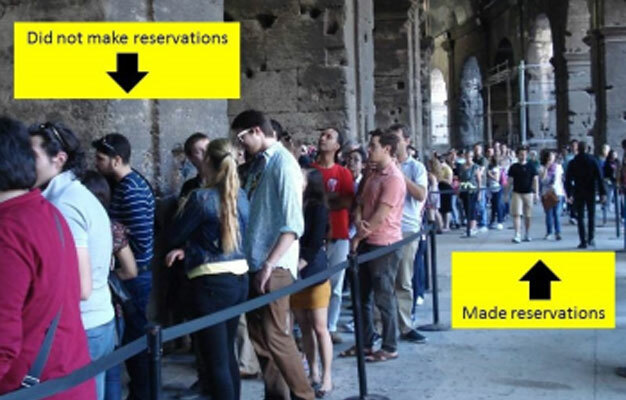 After your tour of the Vatican, you'll get your timed skip-the-line ticket to the Colosseum and directions for how to reach the Colosseum from the Vatican City. We recommend that you spend between two and three hours in the Colosseum, Roman Forum, and Palatine Hill archaeological areas. Please keep in mind that each site operates a strict no re-entry policy. Soon after you have completed your booking your e-ticket will be sent directly to your email. Please print it out or show it on your mobile device. The tour starts at the When in Rome Tours office. The address will be clearly stated on your e-ticket. Please arrive 30 minutes before the tour starts. The guided tour of the Vatican lasts approximately three hours. Is the Necropolis a part of the tour? This tour does not include the Necropolis as only the Vatican administer tours to this area. Your entrance ticket to the Colosseum is valid at 3:30 PM. Yes, entrance into religious sites requires that knees and shoulders be covered for both men and women. When in Rome Tours and Ticmate cannot be held responsible for refused entry due to improper dress. Yes, children's tickets are available for children from ages 0-17. - You will skip all official queues, and they can be very long, up to several hours. However, on certain days like bank holidays, weekends, and religious holidays even for people who have already booked tickets might have a shorter line. This cannot be avoided, but these lines will be far shorter than the public lines. - Cancellations can occur with very short notice. In this case, we will contact you and offer you alternative tour dates or issue you a full refund. - For security reasons, we strongly recommend that you do not bring any large bags or packages. - This tour is a walking tour, as no vehicles are allowed inside the Vatican, so please wear appropriate footwear. The tour operates daily (except Wednesday and Sunday) at 8:45 AM. Your entrance ticket to the Colosseum is valid at 3:30 PM.